If you regularly need to apply watermarks or stamps to documents, such as to mark a document as a Draft, as Confidential, Urgent, and so on you'll find StampIt for Word ($30, feature-limited demo) a big help. It vastly improves on the watermarking capabilities built into Microsoft Word and does a fine job of creating PDFs as well. StampIt for Word includes dozens of pre-built watermarks and stamps. StampIt for Word comes with dozens of pre-built "stamps" that you can easily apply to any document, and makes it easy to built any stamp of your own. You can make them solid, hollow, or shaded, and change their position on the page, can change their color, and can even use images as part of your stamp as well. Applying a stamp or stamps to a document with StampIt for Word as simple as choosing it from a list. Even so, you get plenty of options. You can include the stamp in the document itself, for example, or you can instead print the stamp and document, but leave the document intact without the stamp. StampIt for Word installs as an add-in to Word, and works slightly differently, depending on your version of Word. In Word 2007 the StamptIt menu icon appears on the Home tab; in Word 2003 and earlier, it is on the top toolbar to the left of the Help menu item. 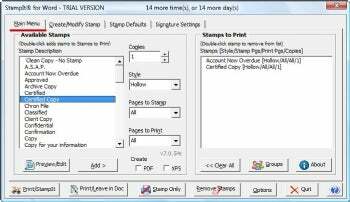 If you only occasionally need to add stamps or watermarks to documents, you likely won't need this program. But if you apply them regularly, you'll find it exceedingly helpful. Depending on your version of Word, you may have installation issues. If you use Word as your mail editor in Outlook 2003 or earlier, you'll need to change that before installation--although once StampIt for Word is installed, you can once again use Word as your e-mail editor in Word. Before installation if you use Outlook 2003 or earlier, select Tools-->Options, then click the Mail tab and select format. Make sure that the "Use Microsoft Office Word 2003 to edit e-mail messages" box is not selected. In versions before 2003, that text reads "Use Microsoft Word to edit e-mail messages." After you make the change, install Stampit for Word, and you can then enable Word as your e-mail editor. In Outlook 2007 this is not an issue. A few more typical installation issues: If you use Windows Vista or Windows 7, you'll have to run the StampIt for Word installation file as an administrator. And no matter what version of Windows you use, you should close Word and Outlook before installation. Also, you may run into problems uninstalling the program, and after you uninstall, may get an error message when opening or closing Word. If that happens to you, re-install the program, and then uninstall it again. Who should use this program? If you frequently use many watermarks and background stamps, StampIt for Word may well be worth buying. But if you use them only occasionally, then the tools built into Word will do the job for you.